Many leading experts in the above areas will give presentations at the workshop. 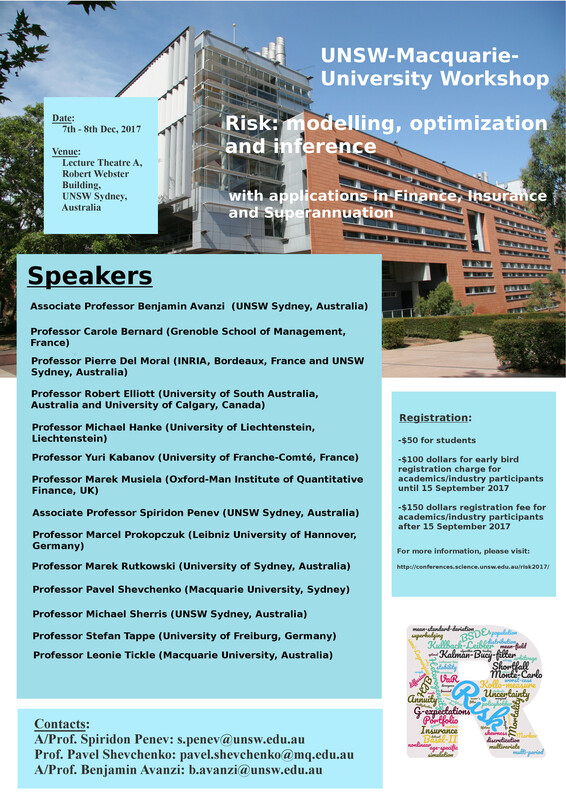 The workshop's dates are Thursday and Friday, 7th and 8th December 2017 and are chosen to be close to the dates of the annual Quantitative Methods in Finance conference (QMF) that will start in Sydney on Monday, 11th December 2017. Professor Stefan Tappe will change his affliation from Leibniz University of Hannover (Germany) to University of Freiburg (Germany) in October this year. Becasue of other commitments, Gareth Peters is no longer able to attend the workshop. We are very happy to annouce that Prof. Yuri Kabanov (University of Franche-Comté, France) will join the team of invited speakers. The workshop's program has now been finanlized. Due to other commitments, Professor Patrick Cheridito is not able to travel to Australia in December. We are very happy to annouce that Prof. Michael Sherris (UNSW Business School UNSW Sydney) is joining the list of invited speakers. All registration fees include lunch on the day of workshop but do not include cost of accommodation. (the accommodation costs are not included in the registration fee). The webpage is constructed with the assistance of Dr Libo Li (UNSW Sydney, Australia) and from the codes and argument collected from the resources below.